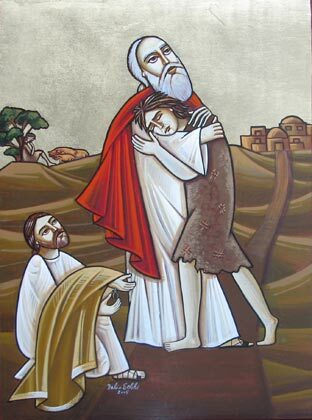 In the Coptic Orthodox Church, we are currently in the third week of Great Lent, and the Sunday reading is that of the Prodigal Son (Luke 15:11–32). Side note, I recommend reading the whole chapter and to read the other two parables of the lost coin and lost sheep. For those who like to memorize or think of quick facts, think of Luke 15, as the “lost” chapter of the Gospel. The chapter contains the three parables of the lost sheep, lost coin, lost son. A nice easy way to remember and store information. Today, I want to focus on this reading and who am I in this parable. I want you to read over the parable (below), and imagine yourself in this story. Who are you in this story, are you the younger son, are you the older son, or are you the father” Think about who you are in this story, as we continue discussing. If you really think about this, this is a tough story! Read the story again through a different lens and perhaps a current culture. I am tired of living at home. I want to be independent. I want to see the world. I want more than what is being offered to me at home. I have the perfect idea, let me just ask my dad to give me money now. He is going to give it to me regardless, whether dead or alive. I might as well take it now, and enjoy myself. Who knows, I may not live that long to see my inheritance, or I may have too many responsibilities that prevent from enjoying the life I want. Why my young son, did you leave me? I took care of you. I raised you. I loved you. I know that you and your brother are different people. My older one is always with me. But where did things begin to differ for you? Did you forget how much I provided for you? Did you forget how much I loved you? At which point in your life, did you, my son begin to lose faith and that you would leave me? I am your father. I love you dearly forever. Why did you leave? As much as this burdens my heart, I cannot keep you a prisoner. I will love you wherever you go, even if it is on the wrong path. I don’t think you should be out there, but I can’t force you, that would not be right, that would not be love, that’s not how I raise my children. Grumble..Grumble..How dare he? Seriously, just getting up and leaving like that. How immature. Doesn’t he know the responsibilties here in this home? Why in the world did dad just let him go?! What has gotten into dad? This is so annyoing, When I was that age, I would have never been allowed to do this!!! Whatever, he wants to leave, that’s his business. I am loyal, always listening, and will always stay next to dad. So, this is my contemplation on the setting or introduction of this parable, with today’s possible language, and perhaps even the psychological thoughts that may have been running through each person’s mind at the time. I know for sure that if I was placed in that situation, I could easily see myself saying any of those items in my head, if I was in that role. As the parable continues, we don’t hear much concerning the older son, until the end of the parable, but there is a focus on the youngest son and the father. I really messed up now. All that money dad saved up to give to me. I blew it all away! Were all those extravagant things necessary? You know what, not a big deal, whatever, I am my own person. I will figure something out, maybe I can get a job and work for somebody. This work is not for me, I am still hungry, I am still in need, I don’t remember the last time I ate. Seriously, I don’t mind diving into that garbage can and seeing what I can find, maybe left overs or something. (As he ponders and comes to). HECK NO!! ARE YOU KIDDING ME!! I AM NOT GOING TO EAT THAT! Dude. I am not doing this anymore. I just realized something my dad feeds the staff at the house better than this. Okay, not a problem, what should I do? How can I show my face at the house? For sure, I will be mocked and laughed at. But, you know what, it doesn’t matter, I messed up, I need to take responsibility for my actions. I am going to go home, tell my dad I messed up, and tell him that because I did things that were not appropriate, please don’t take me back as a son, because a son wouldn’t ask for an inheritance when the dad is alive. I will make it up to him by working for him. At least this way, I can pay back everything I took. Do we see this message of repentance? How many of us understand this? How many of us realize that we are that younger son? We think that we don’t need God, we don’t need the Church, or prayer, or the reading of the Bible. We can get along just fine without Him, but usually that doesn’t work out for us. But when we hit the ground, when we hit that spiritual rock bottom, we hit it very hard, and everything comes crashing in and we are left confused, and we start asking why did this happen to me. In this state of nothingness, when we realize that we were created from the dust of the earth, when we realize that we are in fact nothing without our Lord, this is the path of repentance. As we see in the younger son, when he comes to his senses. He begins to remember the luxury, the honor of living at his father’s home and so desires it again once more. We are the same, when we do these big sins and we move so far away from Christ, we look back and ask ourselves, how did I get this far away from Him? But there is always that yearning to come back, the desire to be restored with our Lord again. But what about the father? This brings us to the next message. When I read this, and I read it through the lens of the father, it brings so much hope and joy. Think about it. This father, in the example I gave was most likely internally asking himself questions of why this happened, questioning his own son and the love of the son for the father, probably contemplating why things went wrong. But the beauty of this verse mentioned, “when he was still a greay way off”. How would the father know he was a great way off? Was he waiting for his son to come back home? I believe that the father with his tremendous love for the son, could not allow for any waking moment to pass without worrying about the return of his son. To me, this verse shows ultimate love, this verse portrays in my mind, a father waiting on the porch every day from sunrise to sunset waiting for his son to come back home. This is true love. The father sees him, HAS COMPASSION, and ran!! He ran for his son, with all the drama, with all the attitude and rejection that his son may have done. The father forgets it all and ignores it, runs to his son and kisses him on the neck! With a kiss, the father tells him I forgive you my son. Are we that loving? Are we that forgiving towards people? This is a very hard part indeed. Many people leave our lives, or do harmful things, or gossip, or treat us wrongly, or bad-mouth us, but what is our response usually in these cases; sadly, sometimes, if not all the time is to hold a grudge for as long as possible. This is something that many of us, myself included have to work on. We have to learn to be that message of hope, that message of love and compassion. The father had hope, he never gave up. He believed in his heart that his son would return back to him at some point. I personally wish I could be like the father, when I see someone going on the wrong path. I wish I could learn the capacity to stand at the door having full hope that he will return back and realize his ways. I wish that in that moment, when I see him from a far away that time will freeze and I will forget everything because I am so happy he is home and I will celebrate. I wish, I pray and hope that I can learn to love like the father loves. So we have repentance, we have love, we still haven’t evaluated the older son. The older son, how many times have I unknowingly in my life been the older son? Can you imagine what could be running through the mind of the older son? It’s not hard, all too easy I am afraid. Read over my psychological summary of thoughts in his mind if I were him. What the heck is that noise? Dude, there’s a party without me!? Let me ask this other staff person here. WHAT THE HECK?! I DON’T GET IT!! I AM SO ANGRY! (His dad walks out, tells him to come inside). Are you serious old man? I busted my rear end doing everything you asked me to do, I jumped through every hoop, followed every command, and this is the thanks I get. Come on dad, I can’t believe you. You never let me do any types of these parties, you never let me do a food gathering or barbecue, hanging out with my friends was never an option. But what happens, all the years of being with you, being your second in command, what did you do? My punk little brother, that’s what you did. You did everything for him, I knew it, he has always been your favorite. Why didn’t you correct him? Why didn’t you discipline him? I don’t want to go inside, I don’t want to see him, because if I do, I am going to give him a piece of my mind!! How sad is this! The oldest son, what a poor troubled soul. This poor soul unable to recogznie the repentance of his brother, unable to recognize that he has come back. This older brother is so focused on the negative, so focused that his younger brother left, so focused that his dad didn’t do anything, but rather gave him a party when he got home. How dare they! I can probably imagine what the older brother is saying, “they should have asked me”, “they should have asked my opinion”. I know more than many of them, I am the one who is older and still here. See this wicked heart! See this judgement, this ego, this selfishness. Can you recognize all these items in the older brother? If you can, that’s great, now we need one more thing to do. Stand up and go look in the mirror my friend. All of us are the older brother. We all have an excuse to be judgmental, to be negative, to be “always right” even if we are wrong. How sad, that the older brother who should “know more” since he has been alive more, you would think he would know how to act. But what happens? Ego overtakes the older brother and comes off as very condescending on everyone and anyone. Reality check. We also are the older brother as well. How many times have we left our egos get out of control. This is the core of the older brother. If someone visited the church today, with crazy tatoos or a bad hairstyle, would you let them stay, or would you begin transitioning them out of the church, becuase they don’t fit that “picture”. This is the problem of the oldest son, rather than rejoice and be happy this his brother who was living in sin, was back again, he focused on the negative aspects of what happened. I urge you again, when you hear this Sunday reading of the Prodigal Son. Review and meditate on it. Are you the Father, who is a symbol of God the Father, who loves everyone, and wants everyone to return and come back to Him, no matter what happened? Are you the younger son, who leaves God, because you think you know better, only to hit rock bottom, and come running back, and repenting of your sin, regardless how many times it happens? Or, are you the older brother, who with all his stubbornness, just like the Pharisees, cannot recognize the fact that his younger brother who was dead is alive, he who was living sin, has repented and come back! But yet, he is so stuck on his own ego, he is so stuck on his own selfishness that he can’t see the lost sheep that has come back home. His own brother, yet jealousy filled his heart instead. Take some type for deeper contemplation. Utilize the Great Lent period to truly fast and pray for anything that we need or ask of Him as we continue down this journey. We pray that we may have a heart full of repentance continually. We pray that we have a yearning of hope and love of the father towards us.